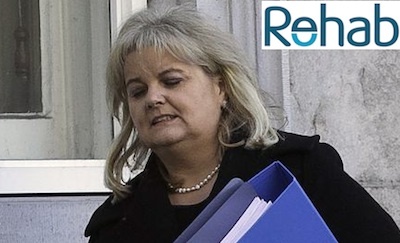 Angela Kerins has finally resigned as the CEO of Rehab in a scandal over the salaries and bonuses paid to her and other senior executives of the charity for the disabled, but those left behind must pick up the pieces, writes Michael Clifford (for the Examiner). To celebrate the departure of anybody from high office is distasteful, but one group of people must be extremely relieved that Angela Kerins has “retired” as chief executive of the Rehab Group. For the last three years, since the issue of Ms Kerins’s salary first leaked into the public domain, those who collect on behalf of the group have had it tough. Knocking on doors looking for money isn’t easy at the best of times. However, if your cause is a charity, your knock resonates with a certain moral authority. The money you are seeking is destined for some of the most vulnerable in society. When that vulnerable group is routinely discriminated in the workplace -- as people with disabilities are -- the moral authority with which you act is heightened. For the last three years, those who go door to door for Rehab moved with less confidence than their cause should have merited. Through no fault of their own, they could no longer claim to be acting with heightened moral authority. Each door might issue forth a query about the extravagant salary of the group’s CEO. “You want me to contribute to your charity while the woman running the place is pulling in quarter of a million?” How do you reply to that? Now, at least, those who expend shoe leather on behalf of Rehab are back in business. They no longer have to make excuses for a CEO who earned a wedge of money more suited to the CEO of a major corporation, concerned exclusively with the bottom line. The entrails of the Rehab saga throw up the same features that have been part of so many of the scandals uncovered since the economic collapse of 2008. Whether it was in politics, in the semi-state sector, in the private sector -- particularly in banking -- and now in the charity sector, the same failings are repeated every time. A culture of entitlement and disconnect from the real world combined to mask basic incompetence in dealing with the issue of feathered nests, once nuggets of information began tumbling out. Ms Kerins salary first became an issue three years ago when The Phoenix magazine ran a number of articles suggesting that her full package came to around 400,000 euro. She failed to address the matter directly, claiming that she wasn’t obliged to disclose her salary. This, of course, betrayed a lack of awareness about the savage cuts that were eating into the fabric of society all around her. Nowhere were the cuts felt keener than within the disability sector. That would still have been a considerable wage for this former nurse who rose up through the ranks of Rehab to assume the top position. Further inquiry about her remuneration could then have been met with platitudes about her acceptance of the new situation in the country, in which those at the top who had creamed it during the bubble years, were now taking some level of pain. She chose not to do so. Quite obviously, she was suffering from the L’Oreal complex. Perhaps she really did believe she was worth it. The next warning signal was issued last autumn. A HSE audit of groups receiving public funds was throwing up some shocking facts. In particular, the salary arrangements for management at the Central Remedial Clinic showed that some were still in orbit out there beyond the real world. Alarm bells should have sounded in Rehab but didn’t. On January 6, Ms Kerins really demonstrated her disconnect by speaking on RTE’s Morning Ireland about Rehab’s work in Saudi Arabia, where she was accompanying the Taoiseach on a trade mission. Naturally, she was asked the burning question, which she refused to answer. Of course, her analysis is correct if dealing with a wholly commercial organisation, which has to headhunt talent. She was head of a quasi charity and didn’t have to be headhunted from anywhere. That furore led to demands for her to fess up. The board of Rehab did itself no favours by saying it would reveal her wage after the next board meeting, some four weeks away. If they thought the matter would blow over, they were sadly mistaken. The charity sector at large suffered some fall-out from this ludicrous situation. The CEO of charity umbrella group, The Wheel, Deirdre Garvey, said “dreadful damage” was being done to the sector by the delay in telling what Rehab’s CEO earned. “We’ve now come to believe that the damage could well be permanent and if not permanent, then long term,” Ms Garvey said. When Ms Kerins’s salary of 240,000 euro was revealed, it spoke volumes. Far from availing of the preceding three years to float back into the real world, she had continued to orbit among the L’Oreal elite. Far from feeling the pain of cuts imposed on people with disabilities, she continued to be insulated from harsh reality. Far from taking a serious drop in money over the preceding three years, she had actually snaffled a pay hike of 6,000 euro. It was all too much for her erstwhile buddies in politics. Everybody from Enda Kenny down, stepped up to express concern at the excess. From then on in, Ms Kerins tenure at the top in Rehab, was on borrowed time. Her appearance at the PAC [Political Accounts Committee] on February 27 brought more bad press. How could it have been otherwise? Frank Flannery, her close associate at Rehab, didn’t show up at the PAC, despite being the man in charge of the committee which sanctioned Ms Kerins’s salary. That backfired, ultimately leading to Mr Flannery’s resignation from both Rehab and as a Fine Gael strategist. The final blow was allegations from a developer concerning the future of what was once prime development land at Rehab’s HQ in salubrious Sandymount. Still, Ms Kerins held on, but it was only a matter of time before she accepted the inevitable. Now she has and she can kick back and enjoy the generous pension she has accumulated. Those left behind must pick up the pieces. There’s a charity to be rebooted, Ms Kerins may well blame the media, politicians, advisors, Paddy McGinty’s goat, whomever, for her professional demise. In the end, if she really wasn’t to apportion blame, she’d do well to look in the mirror.